“Splurge once a week (or every other week)” say so many of my friends and family who, like me, are constantly working on losing weight! When it comes to food, splurging is just not very hard for me to figure how to do! And undoubtedly, this recipe will make sure that anyone’s weight-loss efforts will come to a screeching halt when this little devil of an appetizer is prepared and devoured in wild abandon! 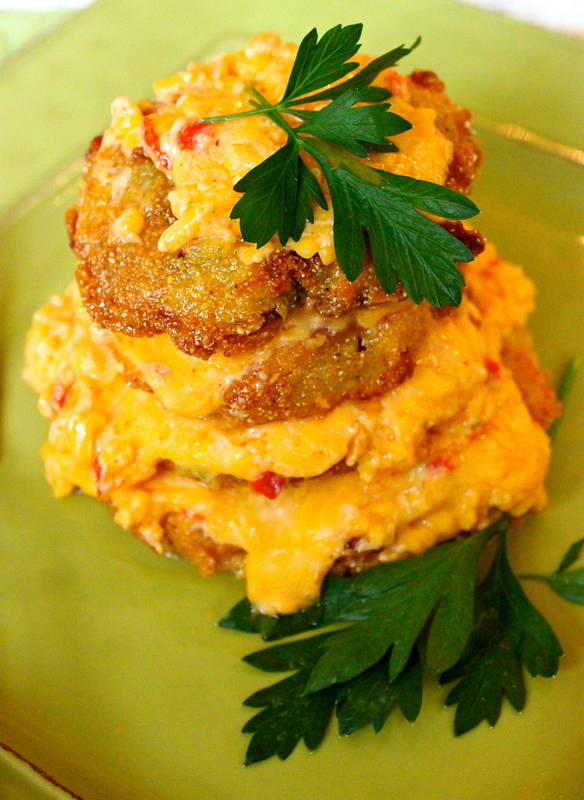 If you love pimento cheese and/or if you love fried green tomatoes, you won’t be able to practice restraint! This is insanely, ridiculously delicious! 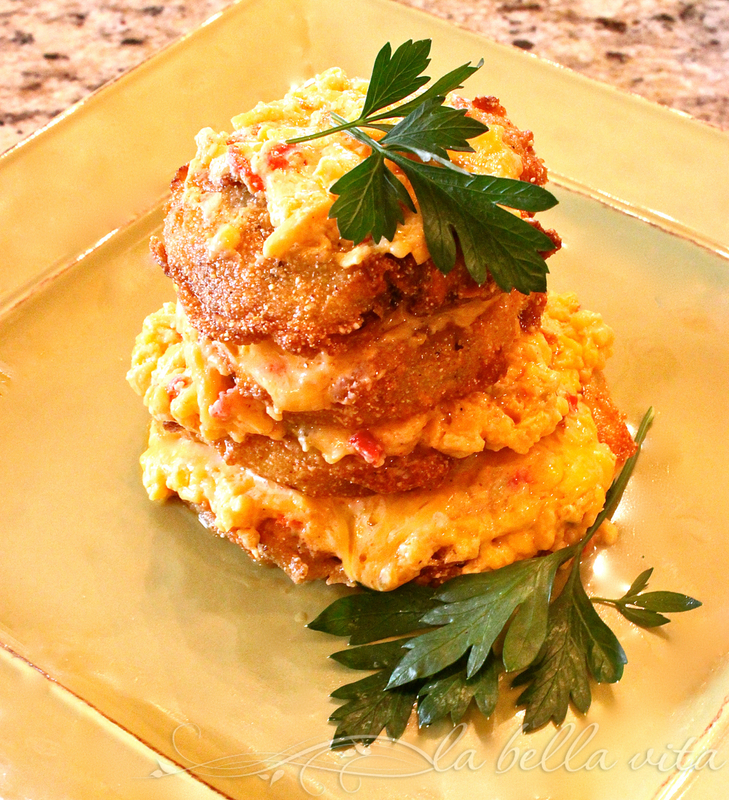 FRIED GREEN TOMATOES with PIMENTO CHEESE STACKS! I had to re-create this appetizer at home! And what I put together lived up to the same level of crazy-goodness that we enjoyed for our birthday dinner — and was actually better! I’ll just de-tox and get back on track with my diet tomorrow (I’ve lost 26 pounds)! 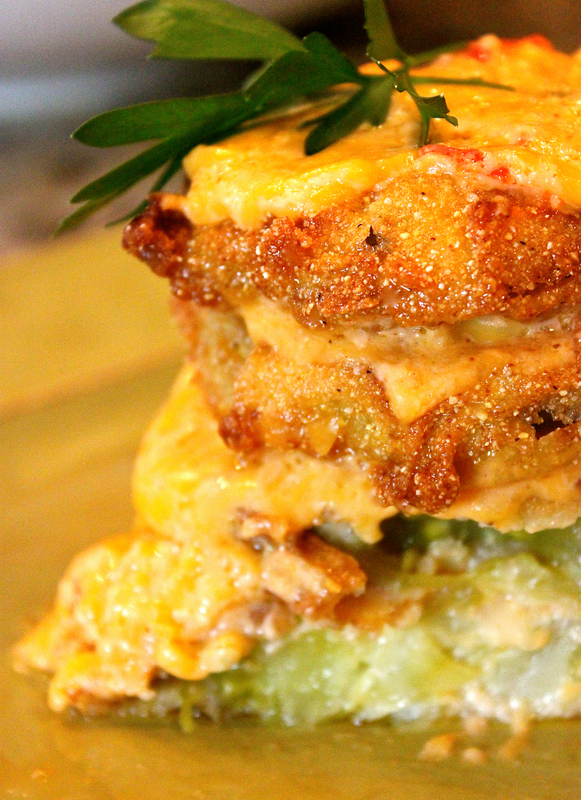 To make these cheesy stacks, simply follow my recipe for Fried Green Tomatoes and stack them up while hot and then spread your favorite pimento cheese in between each fried tomato. Garnish each stack with some fresh sprigs of Italian Parsley. I use a Jalapeño Pimento Cheese that is locally made in South Carolina from “Palmetto Cheese – The Pimento Cheese with Soul”. This young company is getting a lot of attention as word-of-mouth about this crazy-good stuff travels. Here’s the link where you can locate a store near you or to ship directly to you: Palmetto Cheese My daughter can buy it in Tennessee now and keeps a tub in her frig at all times . . . perfect to dip mini carrots or celery sticks into . . . or there’s always the classic lathering between two layers of bread to get your fix! and I’ll publish your comment below (only using your first name of course)! Thank you for using Palmetto Cheese in your recipe. We also appreciate your kind words. The recipe looks wonderful! Send us your address and we will be happy to send you a three pack. WOW Sassy! Thank you SO MUCH! I’ll be so happy to receive 3 of your delicious, wonderful, can’t-get-enough Palmetto Cheese!!! It’s the best and so are you! This is a low country dish if I ever saw one and it looks totally awesome. Your shots made me instantly crave it and I just had lunch. I just ate lunch too, Larry and every time I see these things, I just want MORE! 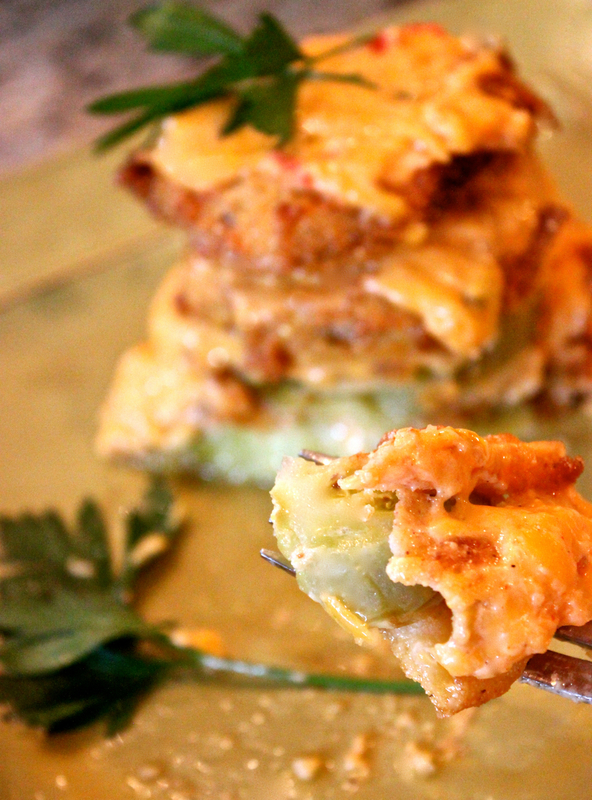 Be still my southern heart – you pimento cheese and fried green tomato stack looks out of this world fabulous. When I was growing up, a jar of homemade pimento cheese was always in my mother’s refrigerator. Now I only eat pimento cheese as a treat and what a treat this would be. Sam, you are so LUCKY that you grew up with pimento cheese. I used to read about it when I subscribed to Southern Living when I lived in other parts of the country and thought, “What is this stuff?” Then I moved here, went to a Southern football tailgating party, bit into one of those soft white sammies stuffed with this cheese and thought I’d died and gone to cheese heaven. And yes, consider these to be a TREAT! I would eat this every day! They look so awesome. Oh Angie, let me warn you, you’ll blow all of your healthy habits out the window if you ate these every day! girl- you are speaking my language now. I mean really? WoW! 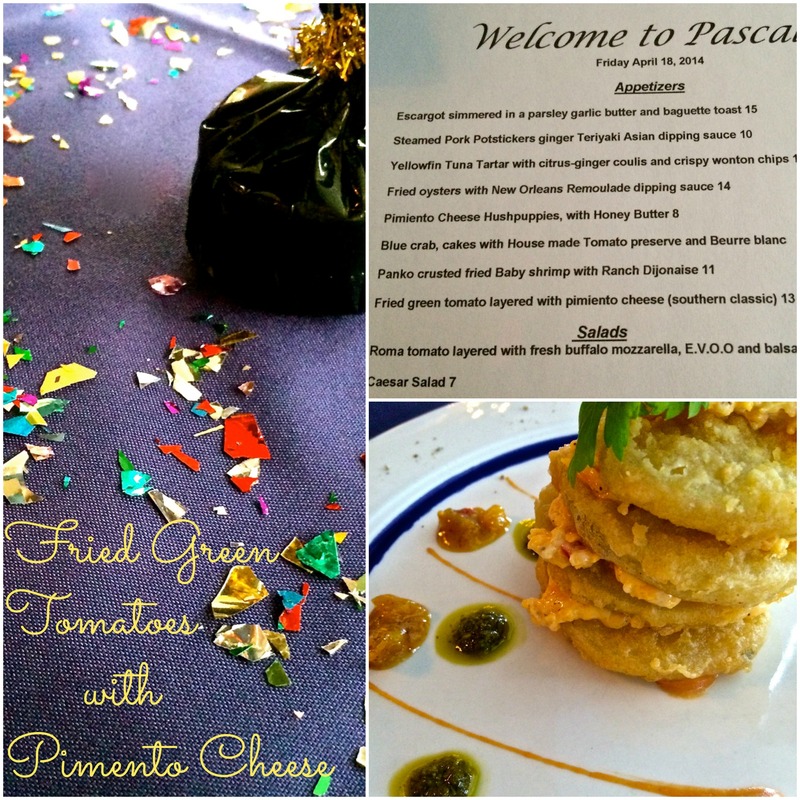 I grew up eating fried green tomatoes and pimento cheese. to put them together is out of this world genius! I have got to do this for my family. they would go nuts! Wow, Roz! This looks incredible! I know I would love it as it has cheese and is fried – 2 of my favorite things. I’m not really familiar with pimento cheese, but it looks delicious. Congratulations on losing 26 pounds! That is so impressive and very hard to do. I have been dieting all summer and am ready to be done. I have put so many recipes on hold that I want to make. The hardest part for me is keeping it off. I have not figured out how to do that yet. I like the idea you mentioned about splurging every other week or so. This would be a great recipe to splurge with! 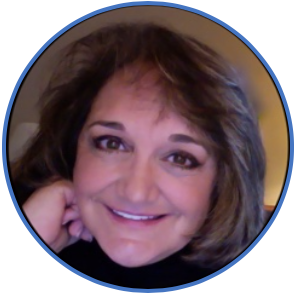 Oh Roz – you are killing me with this one. Fried green tomatoes are one of those guilty pleasures that I allow myself about 2 to 3 times a year – all during the fall when I can find good green tomatoes. I love what you did here with the pimento cheese. What an awesome stack of goodness!!! I am so glad you created this at home Roz, it sounds INcredible. Pinning this one to try as soon as I get moved. We’ve packing boxes like crazy and finding time to read blog and write a post myself has been hard. And good for you, you’ve been blogging a lot lately. I’ve got some catching up to do. Roz, my daughter bought the Palmetto Cheese with Jalapenos just today to make a simple appetizer to bring to a Christmas party tonight. She used to packages of Athens Mini Fillo Shells and filled them with Palmetto Cheese. She baked them at 350 degrees for 10-15 minutes. Once heated, she put a small amount of pepper jelly. Delicious!